In the grim darkness of the far future there is only darkly grim grim dark grimdark. Ahem, seriously, Warhammer 40,000 is a tabletop wargame, know for its almost absurdly grim dark future setting and for its beautiful models that cost about the same as your Masterpiece shelf. Basically, humanity its up to eyeballs in demons, aliens, alien demons, extra-galactic predators, ancient undead robots, and bio weapons that have long outlived thier creators. This is not going hugely well, with the human political system resembling the worst medieval extremes, and technological decline in full effect. Oh, and approximately 90% of any images from it will resemble a heavy metal album cover, or Starship Troopers. The list of things lighter in tone than 40K involves both world wars. But its not all bad...it has Orkz in it! I start this thread as a general discussion for the game, and for whatever we are working on. 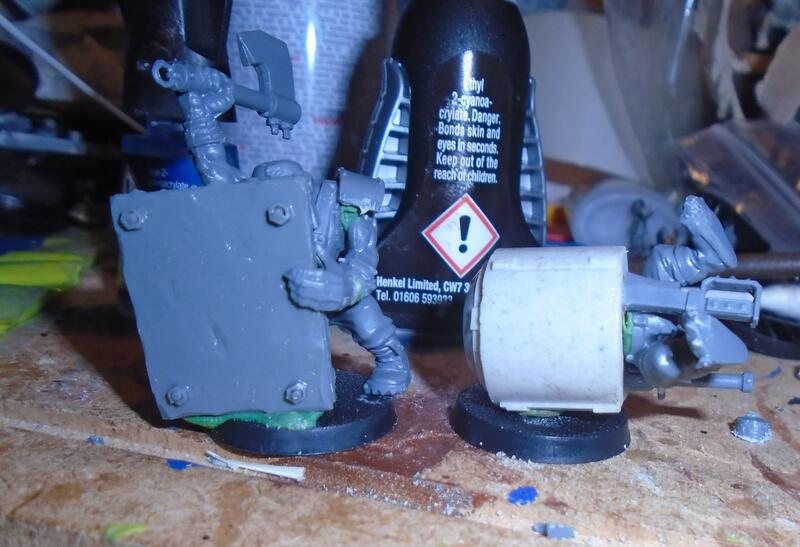 To get us going, here are my Ork Kommandos in progress. I may not take to concept of stealth seriously. This is fantastic and should be a mainline concept! I do hope you give the orkies purple warpaint. For stealth. You are too kind, sir. Its in the grand tradition of comedy Ork units. I plan to build at least 15 of these, and purple war paint does have an appeal. I might do some in hi-vis yellow, now you mention it.